Over the last four weeks, you’ve had the opportunity to view photographs and the behind-the-scenes stories from 48 Northern Arizona University (NAU) intermediate photography students. Let’s give the participating students a big round of applause for sharing their images and thoughts with us in this year’s “Behind the Image: Guest Blogger” project. I was impressed to see how incorporating each of your individual backgrounds and unique approaches yielded a personally meaningful photograph and in many cases, personal discovery and growth. No matter where photography or life takes you, always remember that creativity lives within you if you tap into your individual backgrounds and passions – whether it be travel, beloved pets, people who inspire, moving natural scenes, or intimate details of the world around them – to present your visual messages. Follow your curiosities, learn new things, and be confident in your own voice. 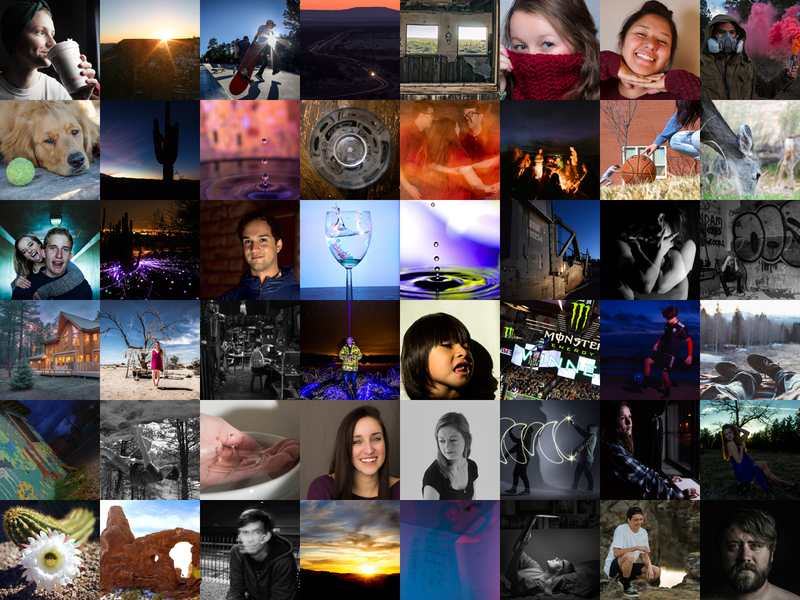 Keep up the great work, NAU photographers! I wish you the very best in your journey ahead! I am also so grateful for NAU Photography Instructor, Amy Horn, who helped coordinate this real-world assignment with her class flawlessly once again. I’m honored and excited to work with someone so dedicated to her students and to facilitating the learning process in photography. Thank you, Amy, for not only your help, but also for what you do to influence lives and the future of photography. To those of you who left comments on the photographs and stories, many thanks to you as well! If you haven’t had the chance to review all of them (and would like to), find the 48 “Behind the Image” write-ups by clicking on the “Guest Blogger” or the “Making the Images” Categories box on the right-most column on your screen. Then, feel free to add your thoughts in the Comments section below anytime that’s convenient for you. Finally, what did you think of this year’s project? Leave us a comment about your thoughts! To the 48 photographers: What did you think of your blogging experience here? Was it as scary or exciting as you thought? Would you do it again? Would you do anything differently in hindsight now that you’ve completed your assignment? What new ideas did you get for your future photography work? To the readers: What did you like about the photography as a whole? What new ideas did you get to influence your photography? What new things might you try now? I look forward to hearing from you! Thanks again, everyone! Until next year’s project! We thank you for such a great opportunity as well. Posting all of these blogs was not an easy task. And the opportunity for my students to be published online is exceptional! Thanks again friend.